Lob a rock into a well-attended contemporary art opening and you will not only become my hero instantly, you will hit at least one artist influenced by Mike Brown. Yet many have never heard of him and, of those who have, several would mistakenly consider him only a minor character in the narrative of twentieth-century Australian art. 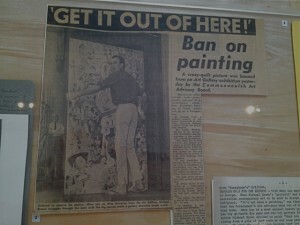 Brown (1938–97) was Australia’s first major proponent of Dadaism and, later, graffiti art. He advocated spontaneous, collaborative art-making, long before it became a common part of so many artists’ lives. Ditto assemblage, appropriation and installation. Brown dragged modernism into the backyard of his Fitzroy terrace and thrashed it with a star picket, in the hope that no artist after him would have to question their right to make art. Outraged by the elite and commercialised art establishment, he was a man of absolute moral integrity, passionate about the accessibility of art and about creative freedom. So what’s with the historical blind-spot? Richard Haese addresses this in his book Permanent revolution: Mike Brown and the Australian avant-garde 1953–97. After interviewing every Australian artist and art dealer born after 1920, all public gallery directors past and present, 218 curators, three-quarters of the living residents of Annandale and anyone who ever sold the artist pot, Haese concludes that Brown was an unwelcome guest at the dinner party of Antipodean art because of his indomitable rebelliousness against it. Had he made it past security, Brown would have spent the evening swearing at Nolan, Olsen, Drysdale and Whiteley, espousing the virtue of Dulux Quick Dry and ‘accidentally’ breaking Robert Hughes’s crystal ware. 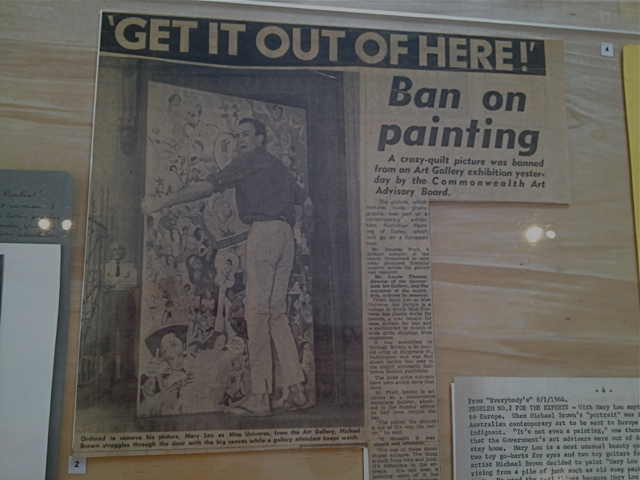 What is remembered about Brown is that he is the only artist ever to have been successfully prosecuted for the crime of obscenity in Australia. In 1967, four years after Mary-Lou as Miss Universe was exhibited at the Art Gallery of New South Wales, he was convicted and sentenced to three months’ hard labour, which was eventually reduced to a $20 fine. Brown may have been unsurprised by the randomness and idiocy of the objection ‘on moral grounds’ that led to his conviction—‘It’s not even a painting!’ one AGNSW trustee is recorded to have said—but still, the response of his peers to the affair, and the coverage of the conservative press, damaged him irrevocably. He suffered a nervous breakdown, and never exhibited in a Sydney gallery again. Like Mike is an adjunct curatorial project running in tandem with the current Mike Brown survey at Heide, and a playful intervention into the story of Australian art. While not suggesting that Brown was the messiah, curator Geoff Newton demonstrates that he was far more than just a very naughty boy. In this and other respects, Like Mike the project is like Mike the man—more significant than the farcical sideshow for which it will be remembered. Like Mike, Linden Centre for Contemporary Arts, Sarah Scout Presents, Utopian Slumps, Neon Parc and Charles Nodrum Gallery, Melbourne, various dates between 18 May and 7 July 2013.